Video and time-lapse featuring Columbia River, Southeast Alaska and Galapagos Islands aboard Lindblad Expeditions – National Geographic ships in 2013. Originally I planned to create showreels for each destination until I juxtaposed the beautiful underwater Galapagos world with the majestic Alaska glaciers and bears. Somewhat my life metaphor of going from one destination to the next teaching photography to incredible people in the most scenic places in the world working with National Geographic Expeditions. The Columbia and Snake River Journey is a land of extreme landscapes of canyons, mountains and waterfalls steeped in the rich history of Lewis and Clark and Native American folklore. This Pacific Northwest destination is a series of modern engineering feat including bridges, locks and dams that allow us to transition 425 miles upriver and climb 725 feet above sea level from Astoria, Oregon to Lewiston, Idaho. The jet boat adventure up the Snake River rapids is another highlight filled with spectacular scenery. The Galapagos Islands are another gem on this earth that will leave you speechless. Everyday, you experience another creature that defines evolution and environmental adaptability. Tameness is a word often used but nothing can prepare you for this extraordinary land and sea adventure. Animals approach you without fear and often times indifferent to your presence. From Giant Galapagos Tortoises in the morning to a playful Galapagos Sea Lion in the afternoon. I cannot wait to return to this magical place. Special thanks to Lindblad Expeditions – National Geographic for enabling me to visit these wonderful places with such entertaining guests. I am really looking forward to returning to Southeast Alaska this summer, the Columbia River in the fall, Antarctica over winter and to Arctic next summer. I pinch myself everyday to see if this is a dream. The National Geographic Sea Bird anchored in the Palouse River, Washington. The Columbia and Snake Rivers are seeped in Native American history, Lewis and Clark’s famous expedition over two centuries ago and exceptional landscapes from the stark Palouse Plains on the Snake River to the vibrant rainforest that embraces the Columbia River are pristine and worth the visit. Mount Hood and the Columbia River at The Dalles, Oregon. For two weeks on the National Geographic Sea Bird, I spent long days with our guests photographing extreme geology, quintessential Pacific Northwest landscapes and the gamut of seasonal colors and harvests. This trip provided something for everyone; educational geology by Stewart Aitchison, detailed and humorous history by Don Popejoy and great wildlife sightings by Lee Moll including dozens of birds and even a Mountain Goat. 542-foot Multnomah Falls near Troutdale, Oregon. Some of the most memorable aspects of our journey were the extreme landscapes from the 198-foot Palouse Waterfall in a desert environment to Oregon’s tallest waterfall, the spectacular 542-foot Multnomah Falls in a rainforest. Experiencing the engineering marvels of the 8 lock and dam systems that we traveled through during 400 plus miles on these rivers is something not to be missed. Overall we climbed (or descended) over 700-feet from the mouth of the Columbia River in Astoria, Oregon to the confluence of the Snake and Clearwater Rivers in Clarkston, Washington. The Lewis and Clark history is visible at every town along the river. The museums included a thorough Native American display at Maryhill Museum to the Coast Guard Museum in Astoria. The weather really cooperated during the harvest season which allowed us pleasant farm visits and wine tasting under clear skies. The spectacular backdrop of Mount Hood and Mount Adams in their glory covered in early snow and clear days at Cape Disappointment were enjoyed by all. This is a highly recommended expedition during the fall season and a wonderful way to experience the Pacific Northwest in comfort and in great company of National Geographic and Lindblad Expeditions. The 198-foot Palouse Falls in Washington. Its been two months since my Galapagos adventure aboard the National Geographic Endeavour and tomorrow I am off to Alaska with National Geographic Expeditions experiencing a much different wildlife among its amazing islands with wonderful guests and crew. The Galapagos Islands are a land like no other and my two weeks spent with an incredible photo team and knowledgeable guides were truly memorable. On land the animals are all perfect specimens of evolution and in the water the wildlife approach humans with no fear. This place is magical. Each week was a well planned itinerary maximizing out time visiting different islands and observing a gamut of wildlife. Some of the more remarkable underwater encounters included swimming with the green sea turtle at Punta Vicente Roca on Fernandina Island and the playful Galapagos sea lions at most of our snorkeling destinations. Galapagos land iguana, Conolophus subsristatus introduced on North Seymour Island in the Galapagos Islands National Park and Marine Reserve, Ecuador. Reintroduced back to an extinct population on neighboring Baltra Island. The iconic land animals include the large colorful Land Iguanas and the highlight of spending time with the Santa Cruz Galapagos tortoise in their natural setting in the highlands of Santa Cruz Island. Please join me for the next Galapagos Photo Expedition on October 25 and November 1, 2013. Special thanks to National Geographic and Lindbland Expeditions. The Amgen Tour of California is one of America’s greatest bike races and has been hosted in the state’s most popular cities and over the most iconic places in the past 8 years. Each year, the course gets more challenging and summons the best riders in the world to compete in this 8 day, 750 mile brutal test of endurance. Fans gather at the summit of at category 4, 12% climb up Balcom Canyon during stage 6 of the 2007 Tour of California. Since the tours inception, I have been covering the race from the inaugural prologue when Levi Leipheimer reached the top of Telegraph Hill in San Francisco in record time to yesterday’s sprint through downtown Ojai. The first few years, I covered the event for Getty Images and now I photograph the race simply for inspiration. 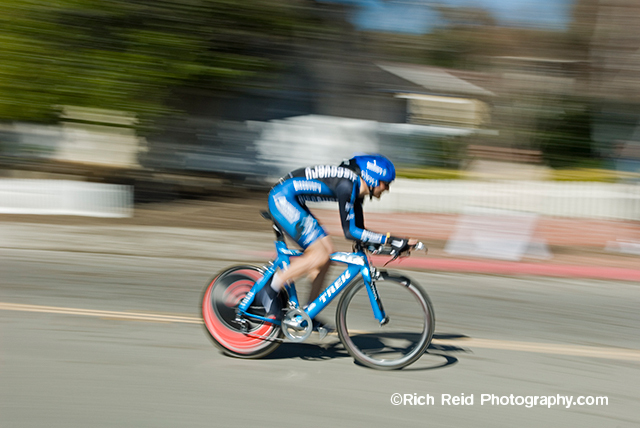 Five image composite of Levi Leipheimer riding to his victory during the prologue of the 2006 Tour of California in San Francisco, California. Covering a professional road race is not easy, in fact its down right difficult. My general approach is to scout my spots using Google Earth looking for topographical features and classic viewpoints on a hill climb and the finish. Half of the entertainment is the crowd, however they pose challenges like kicking your tripod or obstructing your view. I arrive a few hours before the forecast appearance and stake my claim on a high vantage point. Even then, you can never predict the kid that’s uses your tripod as a climbing handhold or a brawl in the crowd. 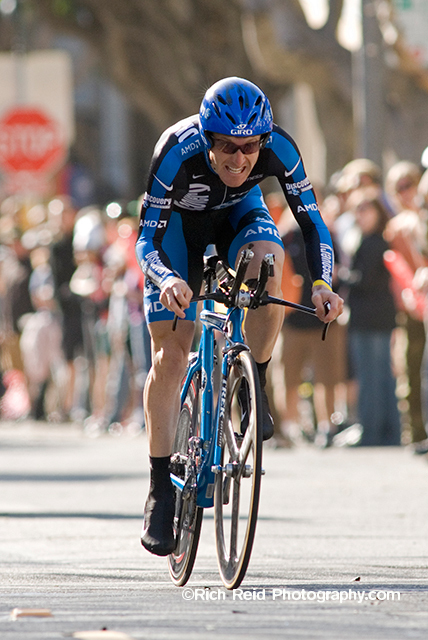 Levi Leipheimer cycling to his victory up Lombard Street during the prologue of the 2006 Tour of California in San Francisco. My objectives are always the same; get great still images and a dynamic time-lapse with only one chance in a “very” short time window. 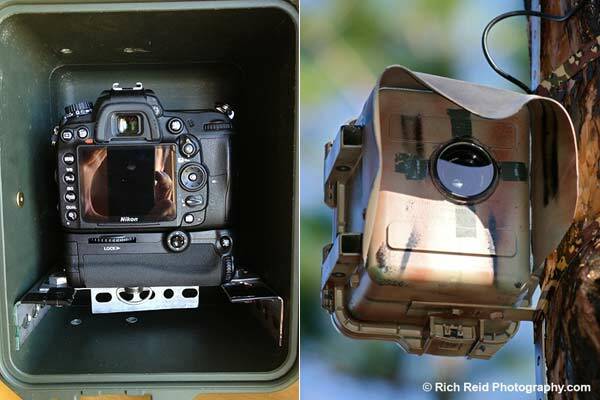 The still images are pretty straight forward but you need the subject with background and the right lens. Wide stitched panoramas incorporating the scenery to tight panning telephoto shot of a time trail are techniques I employed to add value to a static still image. 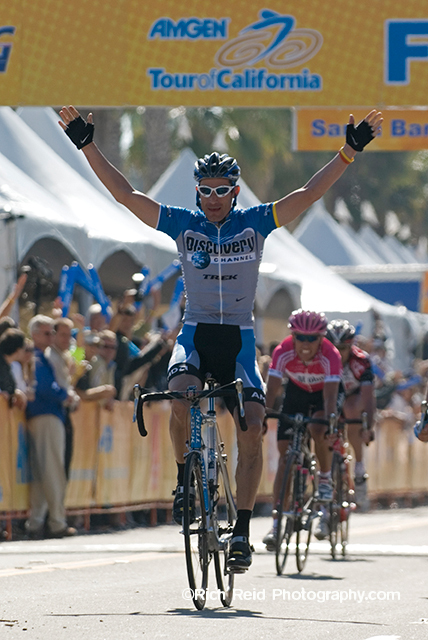 George Hincapie wins stage 5 of the 2006 Tour of California in Santa Barbara, California. The time-lapses require a much more methodical approach and luck….yes luck. When you are trying to predict something in the future, it doesn’t always happen as planned. In most cases, I set my intervals to 3 seconds at least 15 to 20 minutes before the riders appear and then change to a 1 second interval while the peloton passes and then back to 3 seconds. 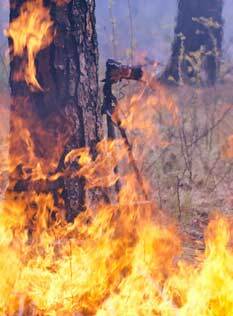 Sometime, I will set my motor drive on multiple images and fire at least a dozen images while they are passing. The above technique will create a “ramped” time-lapse that starts fast, slows in the middle and finishes fast. This can also be done in post, however its much better to have the data (images) when the action happens. I refer to this technique as “stop-time-lapse” and the results can be pleasantly unpredictable. To learn more about time-lapse photography, please visit my website for the next available workshop. Here are a few favorite still images from the race….. 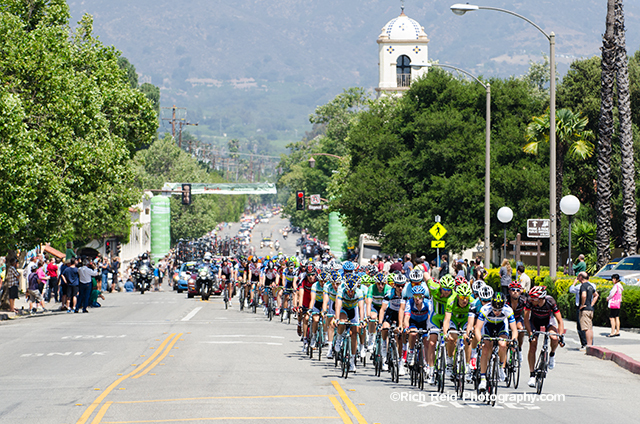 The peloton during stage 3 of the 2013 Tour of California bike race passing through Ojai, California. Ivan Basso riding the time trial during stage 5 of the 2007 Tour of California in Solvang, California. 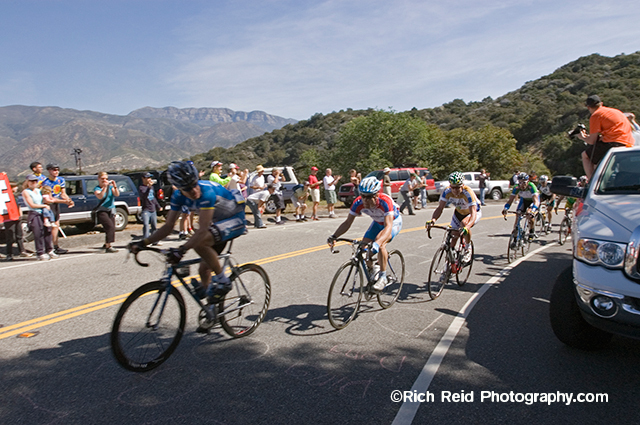 Thomas Danielson, Levi Leipheimer, Floyd Landis & George Hincapie during stage 6 of the Tour of California in Ojai, California. 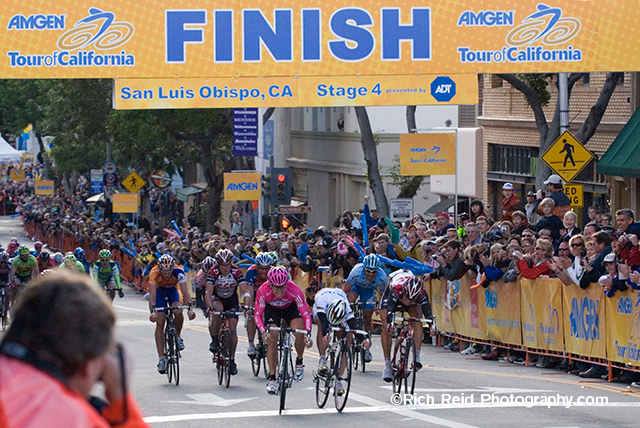 Paolo Bettini, Gerald Ciolek and Juan Jose Haedo sprinting across the finish line of stage 5 of the 2007 Tour of California in San Luis Obispo, California.